This is a superb book that collects some of the best art of one of the top 5 modern comic artist.The book is well done in that it mixes cover art and self contained comic stories ( I never knew Quitely drew so many short stories) so it can be read by itself without hardly any knowledge of DC universe needed.As a bonus there are a couple of previously unpublished pieces ( not many to be honest, the best one being the variant for All Star Batman and Robin that was never released and graces the front cover of this book).My only regret is that we get every cover Quitely drew for All Star Superman but none of the inside art. 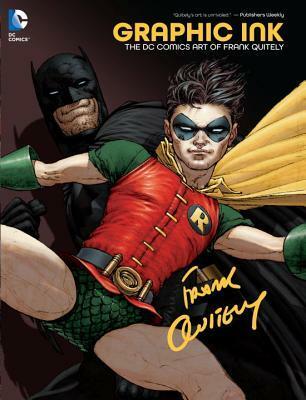 This oversized hardcover - perfect for coffee tables - contains a great selection of some of Frank Quitely's earlier stuff, short stories, Batman: Scottish Connection, and the more recent 3-issue run of Batman Reborn with Grant Morrison. I liked most of the stories included in this collection - especially the ones in black & white (from Paradox Press' Big Book of... series of books); also included are a lot of cover art for a number of different series - however, conspicuously absent from these are the covers that Frank Quitely did for Bite Club, which were as good as anything else found in this book. I believe my first exposure to Frank Quitely's art was most likely in All-Star Superman. At that point I was more interested in the characters than I was in the creative teams so I didn't totally appreciate it. It wasn't until his run on Batman & Robin with Grant Morrisson that I really started paying attention to his work and realized how much I liked it.This art book, like other ones that DC has put out, isn't in my favorite format. Instead of being filled with sketches, and covers, and pages, it's mainly reprinting old issues. Yes there are a lot of covers included, and yes all the art in those issues is great. Unfortunately I find reading one random issue here and there can just be confusing and mess up the flow of the book. 5 stars for the art but some of the stories are poor or presented without context. I thought this was going to be more like some of DC's previous art books, with sketches, layouts, and commentary from the artist. We don't get any of that. Instead, this is a collection of short works and a couple longer Batman stories with covers interspersed.Most of the stories (outisde of Grant Morrison's Batman Reborn, which is great) are interesting but not too memorable. But anyone reading this book is reading it for Quitely's art. It's interesting to see how Quitely has gotten better through the years, especially with his page layouts and panel flow, and there's enough here to see why he's one of the best working today. I just wish they had done something to make this more than just a collection of previously published material. I find graphic novels and art interesting but a little distant and out of reach. Perhaps I was just born too early to completely grasp it. I didn't read much of this and what I did read seemed to be easily forgotten. But my curiosity is still here, so I'll probably try it again soon.